Almost every professional content marketer I know pays for a certain tool to see what content gets shared, who the influencers are etc. Sure I’ve tried it out, it’s a fantastic tool —but the PRO version is not cheap ($99 / month). Using Googlesheets, a clever add-on called Blockspring and a few RSS formulas, you don’t have to pay for it anymore. Having been on Twitter for about 6 months, I’ve tested all the tools. Fact is, you don’t really have to pay for any of it. I come from a spreadsheet background. I can crunch numbers all day. Thanks to Amit Agarwal’s nifty instructions, I now use Googlesheets as a RSS feed reader and a clever add-on called Blockspring to pull in lots and lots of DATA! For example, shared count from the different social media channels for any blogpost or URL (shame about Twitter — we did lose valuable data as more than 50% of shares would come from Twitter). 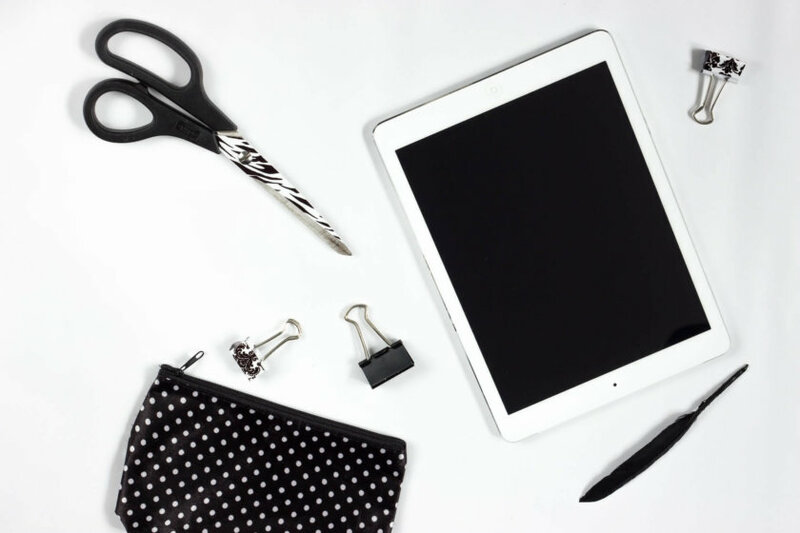 The great thing about using a spreadsheet (besides the fact that I just generated more than $1,000 a year of value in terms of cash savings for you) is that if you’re following a large number of 30–50 different blogs, it can get challenging to find time and prioritizing what to read. The secret is to add a little colour into the spreadsheet. With a bit of conditional formatting, the posts that are performing well will automagically jump out at you. Not only do you have the big picture of how “content” is performing across different social media channels, you get to zoom into the detail wherever you want. For example, I had no idea how Moz vs Kissmetrics vs Content Marketing Institute vs Social Media Marketer performed relative to each other. I was also not aware of how individual writers would perform. 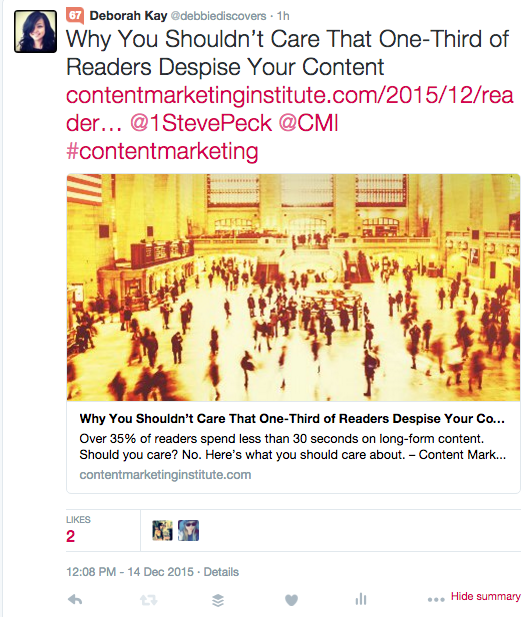 Or much Jeff Bullas’ content gets shared versus other well-known writers (e.g. Neil Patel — except that that’s not a fair comparison; Neil is a better writer, writes across multiple publications and writes A LOT; whereas Jeff hardly ever writes his own content despite the fact that it always says Jeff Bullas #socialmedia #socialmediamarketing #SMM. Well, it sure is a great personal brand he’s built). Note: Take the Net Present Value of the cash savings over the next X years until you retire and go buy yourself nice new a car this weekend. Once you’ve identified what you want to share, it’s a simple modification of the spreadsheet to then craft the tweet. Use this to publish posts from your favourite blog RSS, similar to Twitterfeed or Twibble.io, but with the ability to curate (i.e. choose which tweets you want to go out) and personalise each and every single one of them. The main issue that I have with these feed distributors (and the celebrities on Twitter that use them) is that if you are not careful, it becomes very clear if someone is using a feed distributor to tweet for them — because if they only put one feed on it, all their posts start and end with the same hashtag. #NEW gets boring after a while (see the tweets in the last block below). Or a few days of absence on Twitter filled with nothing but the silence of a string of consecutive quotes from Tweet JukeBox. With Blockspring, you can build a spreadsheet that allows you to add your own comments, the author, the publication and a hashtag (see columnns in blue to the right). Tweets that are above 140 characters are auto-flagged in pink. What if you could choose which feed items to include / exclude AND add your own personal commentary for colour and strategic hashtags for real or automated engagement? I judge the quality of my tweets by how much I can squeeze into 140 characters. An optimal tweet is one where I’ve put in my comments, #POWERPOST, #LOVEIT, some emoji for colour and emotion, a strategic hashtag that gets me retweeted by bots or listed and appropriate credit given to both the original author and the publisher. Who says you can’t have fun being constrained to 140 characters. Save as .csv and upload to Buffer! Including a reference to the original writer is just good Twitter manners — writers like to and should be credited with their work especially if it gets published by a well known publisher like Entrepreneur or Inc. If you want amplification, cite the original writer. Young, up and coming writers who have a larger audience are the most likely to retweet you if you say something nice about their post. If you use a URL shortener like Bit.ly or Buffer, the source is obscured so you definitely want to add the publishing entity. Your followers are more likely to like or retweet you its shows that it’s from Social Media Examiner vs a writer they may not have heard off. Bloggers are way more polite and engaging than journalists and are significantly more likely to engage with you. Old journalists like it if you dig up really old “classics” they published years ago that still resonate today. They don’t reply with a nice Thank You every single time, but that’s probably a good thing as it means that they know who you are. See that tweet in the very first row? Sent using Blockspring from my spreadsheet. Oh I didn’t add any emoji. Let’s try again. But what should we tweet? 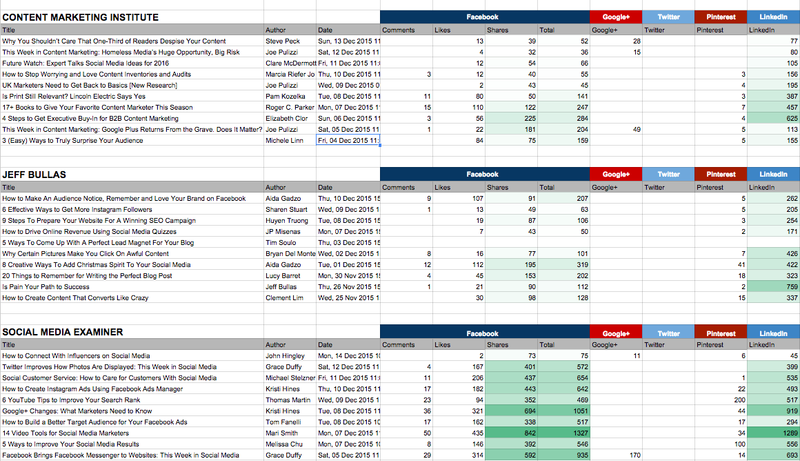 The conditional formatting allows you to zoom in on the most shared posts with laser sharp focus. Go straight to the bottom two. Video. We like Video. Video will be big in 2016. 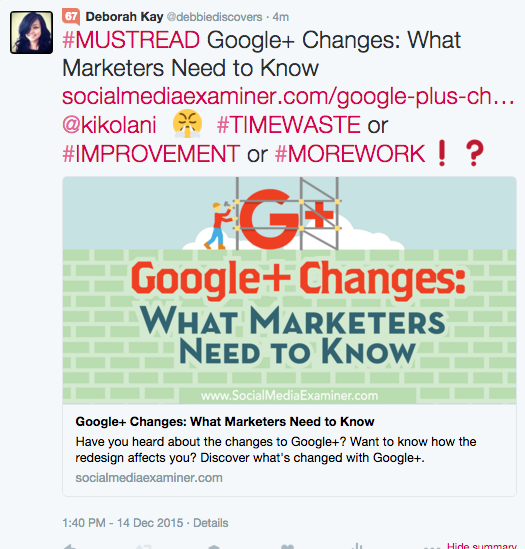 But that wasn’t very smart either — since I am not using a URL shortener, I didn’t need to include @smexaminer. That’s a whole 11 characters, 2 WORDS that I could have used to say something else. Let’s start with Kristi Hines who wrote the Google+ post. Using more nifty Blockspring functionality, I can see that she’s a blogger. Hubspot certified. From Arizona. Lots of followers, listed loads. High Klout score. A quick friendship check shows that we’re not friends. But unless she adds me first, I’m not adding her either. I also can pull her most recent tweets. I can tell that she does engage with other tweeps. No need for fancy reply or retweet ratios that suffer from the law of averages. See tweets highlighted in pink? Those were replies to other tweets. I can see how many faves or retweets each tweets she sent got. If I wanted to engage with her, I could use a different Blockspring formula to either Fave or Retweet any one of those tweets. If I really wanted to get her attention, I could rapid fire retweet and fave. From the spreadsheet, I can retweet her last 3, 5, 10, 20 tweets with the same effort…. Not very pretty for your own time line (but you can always clean it up your own timeline by deleting / unretweeting from the spreadsheet). It might annoy her but if rapid fire retweeting or faving doesn’t result in a response, then one fave or one retweet isn’t either. Amit Agarwal, of course wrote, a programme to determine when you are sleeping based on based on your tweeting habits (which is freakily accurate). Even with automated scheduling, Twitter can tell which tweets are coming from directly from the Twitter app on your phone or the desktop client. Let’s try someone else. Mari Smith. Video tweet. Fancy that, we’re friends. That’s nice. She also engages on Twitter. But wait a minute @Jaysondemers sounds like someone I’ve read on the Huffington Post. And quick google search shows that I was right! Jason Demers is the founder and CEO of Audible Bloom and contributor for Huffington Post and Entrepreneur article she’s referring to is 50 Online Marketing Influencers to Watch in 2016 — Entrepreneur.com which I found prominently featured on her personal website as it surfaced to the top of Google’s search rankings for search terms “Entrepreneur” and both their names. Her most popular tweet is on on 50 Influential Women in Digital Marketing. 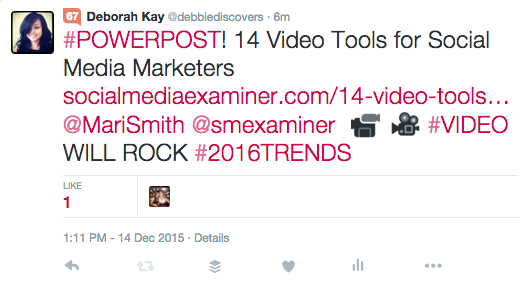 And we both tweeted about the 14 Video Tools — like the way she ends it with Bookmark this! I like her style of tweeting! Going to try that! Hang on a sec.…that was the tweet I just sent. Of course, she wrote that post herself — Bookmark it! LOL. I can also see that she uses Hootsuite, Twitter web client, Tweet Bot for IOS and Pandora. She also has her tweets geo-enabled. And she’s in sunny San Diego at the moment. It’s not magic, it’s Blockspring. Building it yourself…. not so easy. I’ve had a couple of user feedback sessions with them, so they are improving their UX. And hopefully by showing people how they can use it, more people will check it out because it is very, very cool. This barely scratches the surface of what Blockspring can do but let’s see if it’s worth revealing more of my secrets. I already showed you how you can gain at least $1,000 of value. I’m not giving you my spreadsheet for free either. I’ve decided to raise another US$25,000 for Pencils of Promise. A $25 donation to Pencils of Promise will put a child through school for ONE WHOLE YEAR. Leave your email address with comment #MAGIC (which only I can see ) and I’ll email the Googlesheet to you. Just to put things in perspective $25 = 5 Starbucks. I just helped you buy a CAR this weekend and you will change a child’s life forever. Click on this link to go to my fundraising page. This article was originally posted on Medium and is one of the more successful “hacks for good” posts I created! Since writing the post about 5 months ago, I’ve raised almost $74,000 (close to 3 schools)! Blockspring have also improved their interface and usability, and added their own templates which you can download from the Blockspring site. They’ve also added the ability to add “blocks” that run on a user-defined schedule which is great, in the past every time I opened up a Blockspring enabled spreadsheet, all the formula would refresh, which meant that I ran out of API calls very quickly. They’ve also decided to start charging, which is fair enough – they were giving away a lot of functionality for free. Since Dec 2015, I have also come to learn more about Kristi Hines and Mari Smith. Kristi Hines is a fantastic and prolific writer so I take back what I said; I am friends with her and I read everything she writes! Same with Mari Smith. Go to Facebook and watch her present on using Animoto for Facebook video! I now realise how little I knew back then and how power-packed both Mari Smith and Kristi Hines are. Utmost respect to them both. At least I got one thing right – I sure know how to pick them; or at least, Blockspring and a bit of conditional formatting sure do! One final thing that I’ve come to notice is that for most paid apps, you can request for a free developers licence and API keys allowing you to use their products for free or at a significantly reduced cost (highly recommended if you can handle APIs!) Having a code-free spreadsheet based tool like Blockspring gives ordinary people like me API superpowers as I get to automate repetitive tasks to the power of infinity. Besides Blockspring, other players on the code-free block include Bubble (another code free editor, but this one is for mobile apps and integrates with Blockspring) and Dexter (a code free chatbot editor that lets you create Slackbots and Chatbots for SMS or Facebook). Similar to Blockspring, Dexter is free while it is in beta, and I recommend that you jump on the bandwagon while it is still free.